Thus, this sample skewed heavily toward Full-time agents. The following graph shows the satisfaction scores of each group. Top box satisfaction percent reflect those agents who indicated their satisfaction as a 5 on a scale of 1 to 5 (very satisfied). Bottom box satisfaction reflects those agents who indicated their satisfaction as a 1 on a scale of 1 to 5 (very dissatisfied). The statistical differences in satisfaction between the two groups are small. 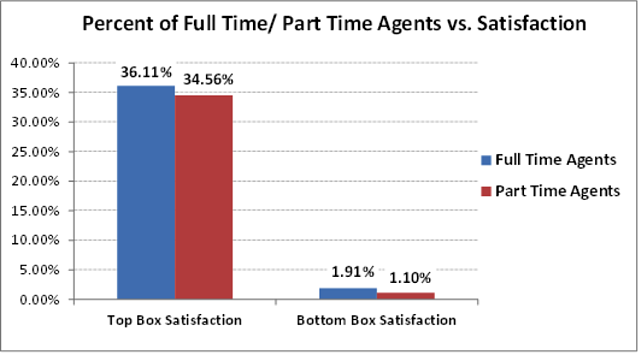 As a general rule, employers should not expect much difference in satisfaction between full-time and part-time agents. Presumably, applicants for each type of position have their own reasons for (and feel rewards from) their status. Full-time workers can earn more, while part-time workers appreciate the extra time and flexibility that their employment status allows for their personal lives or educational pursuits. 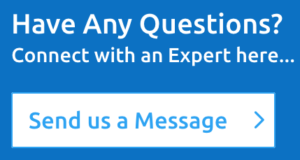 One can expect this satisfaction scenario would not extend to situations where the employer was requiring people to accept part-time status simply to avoid offering benefits required for full-time agents.